A little bit of country, a little bit of rock n' roll - put 'em together and you have Pearls Mahone. 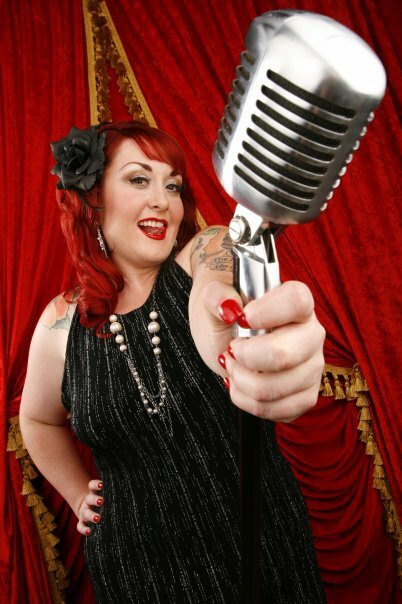 This vivacious red-head has been crooning at gigs and festivals around the mid-west for some time now. 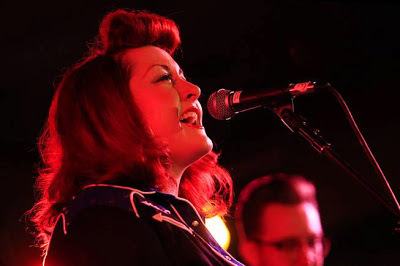 She recently played at the Muddy Roots festival in Cookville, Tennessee along with other legends of roots, rockabilly, blues, country and folk. From what I've read, singing and performing have been a major part of your life ... how did you know that you first wanted to be a performer? I just loved to sing. It was something that came naturally to me, and I loved to perform. I'm a first born so attention is "my thing" I think. I started in middle school through school and church choirs and it just grew from there....Something I've always wanted to do. Who were some of your influences when you were younger? I always listened to "Breakfast with the Beatles" on WCKG 105.9 after church. My dad LOVES the Beatles, so I grew up listening to them. The Mamas & Papas ... lots of 50's and 60's era stuff alongside the rap/hiphop/r&b/rock/ and punk of the early 90's. And what about recent bands? Is there any good music coming out these days? Oh man, I listen to a lot of people. Hangdog Hearts, Hot Club of Cowtown, Billy Cook Band, Rachel Brooke, Hooten Hallers, Pistol Annies, Restvrant, Anything with Joel Paterson on it, JD McPherson, Nikki Hill, Jayke Orvis & The Broken Band, really the list goes on and on. I should start listening to older stuff. Well it seems like your sound is very influenced by the sounds of the 50's and 60's. I always believe music comes and goes in cycles and while there is always a core following, older music does become popular again with the mainstream. Do you agree or does it even matter? Yes, I'm moving even further back - 40's/50's Western Swing is something I'm really getting into. Music, Art, lots of things are cyclical. People also borrow from the past and put their new spin on old ideas. You perform some of what I would call classic country. What is your opinion on the recent stuff coming out of Nashville? In my list I threw in Pistol Annies, love them! Lindi Ortega is also really different....there are people that are doing some good stuff, but they don't get the credit or the air time they deserve unfortunately. I wish more of us could break into the Nashville system and bring back country to its glory days. You currently play with the OneEyed Jacks ... can you tell us how you found these guys and what performing has been like with them? Actually The OneEyed Jacks have been a revolving door roster of players that are available to me a the time. Currently my lineup includes 2-3 other females besides myself! So I'm moving away from using The OneEyed Jacks in billing my band. I have a brand new guitar player, Dennis Leise. Buster--my original lap steel/lead guitarist, and I split in January after 6 years together. Dennis is very knowledgeable in old timey music, western swing, and country which is awesome and where I want to take the music! Are you hoping to have a more permanent fixture of musicians on stage or do you prefer the flexibility of having different musicians and backup singers for different shows? I would like more permanent lineup, but with more talented musicians comes more performing opportunities for them besides my band. It's very hard to land a knowledgeable stand up bass player. I'm struggling to find one locally or in the region to tour with me out to Montana and back this fall. I might have to fly one in from the East Coast! In a way, its the Nashville way, but I have a pretty solid lineup besides the bassist predicament! It is the Nashville way. I might know a few people who know a few people who play stand up bass. I'd be glad to put you in contact if it helps you find someone talented. You also run PearlyQ Productions. I'm guessing that helps increase your network of finding talented people? That was created to help bring my friends who constantly tour a place to come in Chicago. Well, you are never too old to learn. If you could travel to any time period to perform, what era would that be and why? I think the 1940's be a cowgirl crooner in a touring band would be great ... get big like Patsy Cline. Just that everyone should stay tuned for my LIVE @ Moonrunners CD and some new studio stuff in the near future! We just hit 3,000 LIKES and have a merch liquidation sale going on now. Just keep listening and sharing the music---hope to be touring more in the coming year. looking forward to getting south, east, and west! sorry midwest you've had us too long! Major tour this summer to Farmagedon Music Festival July 25th - 28th in Missoula Montana. Fans: Ask for us on your internet radio stations, favorite car shows, and music festivals!